We’ve come a long way since the days of conventional photo and video shoots. With the advent of drone technology — the core of our business — no longer are we required to contort our bodies into awkward shapes and angles just to get breathtaking shots of a property, a wedding, or just about anything else. With the help of Jonathan, drone pilot extraordinaire, breathtaking shots are made easy. Now, if the constant buzzing noise of a flying drone is something that brings you a little anxiety knowing that an “unmanned” aircraft could fall out of the sky and hit you, we’re here to provide you with some relief: safety is Jonathan’s number one priority when it comes to his real estate drone photography business in Los Angeles. Truly, whatever job Jonathan finds himself involved in, you can rest assured that his drone video services follow the best practices when it comes to laws, regulations, reasonable expectations of privacy, and, of course, personal safety. Here are a few of the many safety practices that you will always see Jonathan employ. Some places just aren’t meant for a drone shoot — especially tight, narrow or overly-congested areas. Open spaces with minimal signal interference are ideal, but it is possible to navigate in urban settings. Imagine a drone sudden dropping out of the sky because the battery died. Fortunately, this will never happen with Jonathan’s drone video services in Los Angeles. Integral to flight orientation, a calibrated compass and other associated hardware is important for safety and optimal flight control. Without a remote control, there’s no…control. This one is pretty straightforward. During flight, Jonathan will only fly the drone where he is permitted to do so. As far as personal parameters go, these details are typically outlined prior to the shoot. Landing is never a challenge, perse, but as to avoid damage to the drone or anything nearby, Jonathan will make sure that he chooses a safe place for the drone to land before he retrieves it. 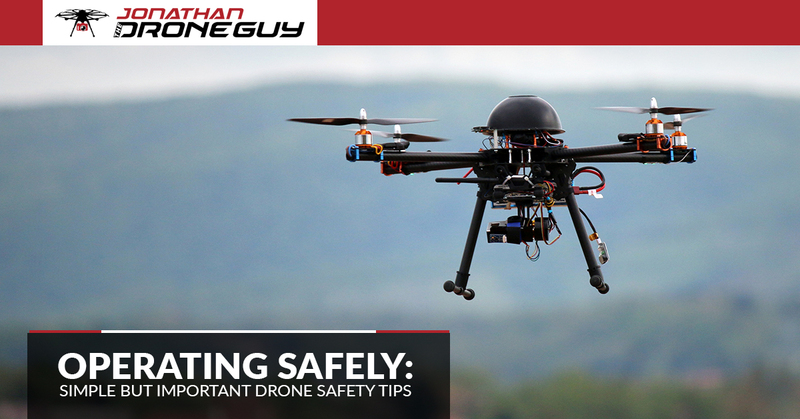 Once the drone unit is safely back on the ground, before Jonathan turns off his remote controller, he’ll manually power down the aircraft first. That way, in case anything goes wrong mid or post-landing, he’ll still have control. Good-quality propellers aren’t necessarily inexpensive. They’re necessary for a smooth, controlled flight experience, and so they’re typically removed shortly after flight. There shouldn’t be any surprises about the drone video shoot or photo shoot. If you’re having a wedding captured via drone, let your guests know about it! Open communication is a major component of safety, and Jonathan won’t go out to a shoot until these details are entirely squared away. Get a Quote For Jonathan’s Drone Video Services Today! Are you in the greater Los Angeles area? From Pasadena to San Fernando and Santa Monica, we’re ready to capture what you need capturing. Get started now.